For those of you who are not familiar with sailing, these Q & A's should help give you a picture of what life on a sailboat is really like. Already experienced sailors won't need all thisbut there's still plenty of other useful details for you too! We can't count the number of times people have told us that this was their "best vacation ever", a "dream come true", it "totally surpassed expectations", and other such comments. BUTsailing isn't for everyoneand maybe the reason why we get so many comments like this is that we are very down-to-earth in setting expectations. A sailing yacht is not a cruise ship; and if this type of vacation isn't going to suit you, it's better realised nownot in the middle of the Aegean with not a hairdryer nor ice cube in sight for miles! :) We hope these notes will help. . .
Q. A comment that we know our SeaScape sailors get all the time "Wait a bit. . . you're going to spend 2 weeks on a boat with a bunch of people you don't even know?? You must be crazy!! What if they're all weirdos?" A: A good point! Butthe actual fact is that 95% of the time, everyone on board gets on just great, and ends up really good friends. How come?? 2)and just to be QUITE sure, we go on . . . and on. . . at great length. 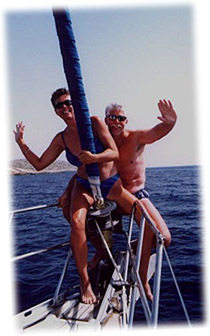 . . :) to make sure that everyone who books with us totally understands what life on a sailboat is all about! We DO tell anyone who we don't think is really suited that they should reconsider. We're not doing anyone any favours by not being totally candid about this. 3) Then finally, we do our very best at playing "crew matchmaker"! Believe me, when we SeaScape crew are also living on the boat with you, we know just exactly how important group dynamics are! We don't put a group of young 20yr old partiers on board with, say, a 50yr old couple doing a romantic anniversary trip. Obviously, we can't make any absolute guarantees, but our success rate is pretty amazingly high (ask our previous sailors !). 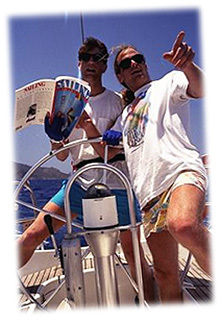 Q: So who does come on SeaScape Sailing trips? A: A huge variety of people! A wide age-range, from 18-73; though many tend to fall into the 30-to-late 40s bracket. Some very experienced sailors, some who'd literally never set foot on a sailboat before. Some folks come with a friend/partner; some travel solo. Some people have travelled/worked all over the world; some had to get their very first passport issued to join us! The common denominator is most definitely attitudefolks open to new experiences, able to wash their own underwear in buckets when no laundry facilities are available. . .people whose worlds do not stop revolving when no ice is within miles of their gin n' tonic (Promise we won't run out of the G&T's though). A: A number of people have emailed us asking what the age limit is. There IS no age limitour 73yr-old sailor was helming in 25knots within a couple of days (and she'd never sailed before!). Howeverone important point that we DO need to make ( and of course, this doesn't apply just to age)is that a sailboat does need a certain amount of physical mobility. You need to be comfortable climbing over one boat to another to get to dock at times; in and out of inflatable dinghies; across a narrow gangplank from boat to shore, and so forth. Q: I think I'll like sailingbut I've never sailed/actually lived on board a yacht before, so I'm not totally sure. Any ideas?? A: One of our former clients came up with a perfect description for sailing a few years ago; he said it's "Like camping on the water". OK, so a 50' yacht is pretty luxurious camping . . .but if this is the sort of back-to-nature experience that you enjoyyou'll love sailing. If your ideal vacation is being being served cocktails on deck and being pampered in some floating Hiltonwe're the wrong company for you. Q: I'm definitely an adventurous sort, love the concept so farbut I'm concerned about getting seasick. Is this often a problem? A: If you've gotten seasick being out on a boat for an afternoondon't worry that this means you'll never make it as a sailor! It takes most of us (yes, including us skippers!) a day or so for the inner ear to adapt to the different motion. The vast majority of people are fine after that. For those who are still a tad susceptiblewe have some great "magic pills"(they're legal, it's OK! )a seasickness remedy which seems to work amazingly on almost everyone, does not create sleepiness, dry mouth, or any of the other usual annoying side-effects. If you are the type who gets motion sickness on everything: cars, planes, boats. . . bathtub. . . this is the time to wonder if a sailing vacation is for you. If you still really want to give it a goconsider coming early or late season, or to Turkey, where the winds/seas are lower. Q: So how much sailing experience DO I need? A: None at all!! Lots of people turn up on our boats never having sailed in their lives before. 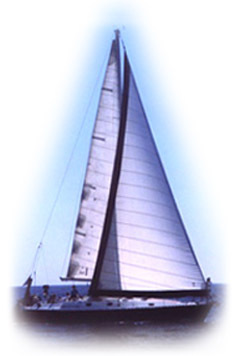 If you want to learn about sailing, we are delighted to teach you! Howeverthere's no obligation to pull on ropes if you don't want to; if you'd rather just hang out on deck and soak up the sunthat's fine too! we skippers will be quite happy to sit back and take a break for a change! Q: What is the usual group composition? How many people are in each group? On each boat? Our shareboat groups tend to vary a lot in their composition. Some will be primarily couples; some will be more orientated to single travellers. Some will be high energy, get-out-there-and-do-it trips; some will be more laid-back, relaxing, just plain hangin' out and recovering from a hi-stress lifestyle back home. This is why we ask you to give us some personal info on yourself; to help us make suggestions to you on which groups you'd most likely have most fun with. b) Make up your own group, but still use the same easy-going "adventure sailing" formula. If you can get your own group of friends together, you have the option of taking one of our boats for your exclusive use. This means that you can (within logistical reason!) set your own itinerary, your own schedule. The group rates do offer a significant saving on the individual rate, as of course, you are doing some of the admin work for us, putting the group together ! c) Own group with full crew. 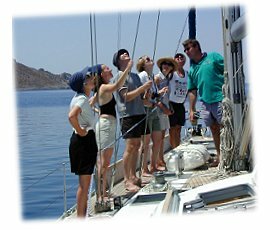 For those with their own group of friends, who would really prefer to have another crew member on board to help with the sailing , and do all the cooking/cleaning, etc - check our our "don't lift a finger" option! A: The maximum number of people per boat is 8. Sometimes, especially with our shareboat and singles groups, we'll have a couple of the boats sailing together - which is always a lot of fun ! Q: You mention 'singles' groups: Do you run trips that are specifically designed for 'singles'? A: Well, we're not in the "LOOooove Boat" business! (though we do have much fun adding notches to our mast for successful onboard romances on occasion . . .:> ) We don't run "singles" groups with any match-making intentions; but on the other hand, we do recognise that being a single around a bunch of couples can be "socially challenging"! Travelling with other singles, you don't feel "left-out" in a world that's often primarily couples-orientated. In general, our 'singles' groups tend to be fairly high energy, get-up-and-go sort of trips; the group dynamics are usually strong (and very fun! ); people tend to get to know each other real well, real fast. Howeveryou don't have to be a 'single' to join one of these tripsif description fits your idea of a fun group but you're with a partnerc'mon along!! Q: What are the boats like? A: We currently have 3 yachts in our "Adventure Sailing" program. They are all in the 50' range; "Angelina" is 49'; "Vassilis" is 53', and "AnnaMaria" is 55'. They are all the same age; built in '91 in Athens. They are designed specifically with Mediterranean sailing conditions in mind; they're airy, spacious, built-for-comfort yachts. OK, so we're not going to win any America's Cupsas with all beamy cruising yachts, their windward performance is not the best in the world. But hey, what does an extra half a knot matter in the Greek isles?? They each have 4 double cabins, plus crew cabin(s); the f'ard ones covert to either bunk beds or double beds. Each cabin has an en suite head (bathroom). There's yet another shower on the aft swimming platform of each, so having to wait for a bathroom is hardly a problem! Q: What's it like to live on board? A: We're pretty laid-back about most things, but there's a few basic rules that keep life on board happy for everyone. For instance, keeping the saloon free of personal junk, not partying on till the wee small hours when others are trying to sleep, not using all the precious water to wash your undies when we're days away from the next water supply. All these sort of issues are covered in the (even more extensive! ) notes we send out on booking. Q: What are the sleeping arrangements / cabin assignments? A:Each yacht sleeps up to eight guests in four double cabins. The two aft cabins are double beds, the two f'ard cabins can be either single bunk beds or convert to double beds also. First to book, first to choose is our policy on who gets which cabin! In mid season, lots of people opt to sleep on deck tooa great feeling, completely clear n' starry nights, no threat at all of being rained on halfway through the night! Q:Is there a single supplement? A:In general, we don't have a single supplement - most people are quite happy to share a cabin. However, for those who would really prefer a double cabin to themselves, we can sometimes offer this at 1.5 times the regular price. Q: Is there hot water? A: But of course!! We might be out to downplay the facilities and tell you it's like "camping on the water"but in fact, it's really quite civilised! In fact, many of our guests who are experienced sailors tell us they were surprised at how luxurious the boats are, compared to what they are used to sailing! So, yes there is indeed plenty of hot water, in each of the 4 showers/toilets. We also have two fridges on each boat, a stove w/oven, a great CD collection, novel library, snorkelling gear and all sorts of other toys. Q: What about food n' drink? A: We keep the boats well-stocked with supplies for breakfasts, lunches, drinks, snacks, fresh fruit, etc ; and the bar is always open too! If there's something in particular you want that's not on boardjust add it to the shopping list. This is all included in the cost of the trip; and it's all very much on a help-yourself basis. Q: So who does the cooking and keeps the boat in order?? A: There's not usually a great deal of cooking on boardmost of our dinners are ashore (see below), and an array of salads / cold plates are usually the preferred option during the day. Breakfasts are very much help-yourself-whenever-you-get-up; Greek yoghurt, honey n' fruit is one very popular choice! Luncheseveryone is expected to help out sometimeschopping tomatoes for a salad, arranging a cheese platter, clearing up afterwards, etc. Occasionally, a group will get inspired to cook on board in the evening... a quiet anchorage, cocktails and dinner under the stars is quite wonderful ! Whilst this is not officially included in the "package price", we do like to keep things as flexible as possible, and not spoil any spontaneous fun! On almost all other crewed yachts, the charge is $35+ per person to eat dinner on boardnot our style!! Usually, we suggest a "swap"eat lunch on shore, do dinner on board. We're not uptight about this, and don't go counting meals. . . we just ask that people are fair to us on this score. Q: Dinners ashoredo we eat out every night? What should I budget for this? A: Most nights we eat outin Greece and Turkey, the taverna is an essential part of the whole experience; it is the social hub of the community, the rendezvous central for all gossip and socialising. Unlike the more usual western experience of the "move 'em in, move 'em out" mentality, once you occupy a table, it's yours for the evening, and into the wee small hours too, if you so desire! In fact, the problem is not having the check slapped on the table before you've even put down your fork; it's getting the waiter to come over and take your money! It's a totally laid-back atmosphere; bills are often tallied up on (paper) tablecloths, the drinks bill is figured out according to how many bottles are on the table! As far as budget goes. the average cost for dinner is around $15 USD. That's usually a real feast of appetisers we often share around, and main course too. This includes some beer/winealthough if you go for some of their more expensive imported wines, you'll have a bigger bill. If you're a light eater, or don't drink, your bill will most likely come out well under $10 USD. Q: What other costs should I expect? A: Very few! That's our whole philosophy of "once you're on board, it's all covered!" The only other spending money you'll need is if you decide to go rent scooters on some of the bigger islands; they cost around $15-20 per day. Jeeps are around $60/dayfit 4 people in, and $20 per person is quite the bargain. Of course, if you decide to go hit the town and get into expensive cocktails, this will clock up a few extra $$s. Though all things are relative: you probably couldn't spend as much on a night on the town in Greece/Turkey as you could at home, no matter how hard you triedso may as well make the most of it! The other warning to issue is about those Turkish bazaarshighly dangerous to Those Born To Shop! In fact, even those who have professed a profound dislike for such activities have been caught creeping back to the boat with armfuls of goodies. Beware!! A: Most nationalities do not require a visa for Greece. There is a visa needed for Turkeywhich is more a revenue collecting exercise than anything! These are issued on entryno need to worry about applying beforehand. The amount they'll charge you varies according to what passport you hold; eg, US passports are $45; Australian $20; British 10 pounds. Canadian passport holders, for some reason, pay nothing at all! - ask us not whywe have no clue what the logic is!! If you like it hotgo for late June to early Sept! August is the hottest monththough happily, it never gets really too hot in the Dodecanese; there's almost always a cooling breeze, and the humidity is very low. But if living from morning till night in no more than a swimsuit is your idea of heaven, you'll like it mid-season! However, mid-season is NOT the time to be in Turkey. From mid July through August, it is exceedingly HOT HOT HOT, and humid too. Even the total sunworshippers amongst us can't handle it this time of year. Also, it gets very crowded - though this might seem contradictory, the fact is that Aug is the BIG vacation times for much of Europe, and Germans/Italians especially come flocking down. Happily... not too many of them make the Dodecanese islands.... which is another reason why we go sailing off to Greece for the midsummer months! If you're not a heat fan at alllate April till mid June or mid Sept till end Oct would be a good time for you. The less you like the heat, the further towards beginning or end of season you should go! In April/early May and mid-Oct onwards, you'll be wearing long pants and probably sweatshirt in the evenings; daytimes are still definitely shorts n' t-shirts weather though. One more SeaScape motto: "If you can't sail in a swimsuit (or less), you're in the wrong part of the world! "so we only sail when the weather is good! Wind strength follows temperature, roughly speaking. So in April / early May, the winds are light; 15 knots or so, some days of flat calm, the occasional one or two of 20-25knots. Same in Oct. (Sept can still have some stronger winds). 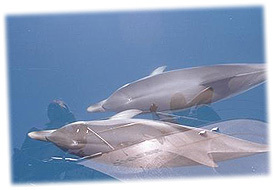 The winds gradually pick up towards end of May, then in June, the summer winds are well established. July/Aug is traditionally meltemi timethe summer winds of 30knots or so! It's not always been the case for the past 5yrs or so. . . but, if you're hoping for real exciting sailing, this time of year gives you the best odds. Soin summaryif you don't want any big windscome early or late. If you're an experienced sailor and looking for some exciting sailingor a landlubber who loves the idea too!come on out in the middle of the season. Turkey tends to be calmer than Greece, so if you're a little uncertain of your sealegs, this would be a good choice. One other great advantage of the Dodecanese islands is that they never get really crowded. So even in August, we never have to play sardines on the beach! But, if going out on the town and having some fun nightlife is important to youcome out in JuneSept in Greece; May & Oct are very quiet. This doesn't apply to Turkey, however; the night spots in Turkey are a-hoppin' right from April through till end of October! Q: Which is bestGreece or Turkey? If you're not sure of your sealegs; if you've never sailed before, are concerned about possible seasickness, or in general just want a very laid-back, gentle sailing experiencepick a Turkey trip early or late in the season, when the winds are lighter. If you're really into ancient culture, and love poking around old ruins, relics of civilizations from thousands of years agoTurkey is the place to do it! Many people imagine that the Greek isles are just littered with ancient ruins; not true! Of course, there is the Acropolis & Delphi, which you might want to visit on your way through Athens; but on the whole, many of the islands do not have much of real ancient interest. Their primary historical sites are more recent; mostly from the 10-11th century Crusader days. Turkey has the most fascinating ruins, amphitheatres, etc, scattered all along the southern coast; every little bay seems to have something dating back to BC times. Turkey can be either very lively or very peaceful. On our shareboat trips, we include a mixture of the busy, bustlin' towns and the secluded anchorages. If you're considering a private charter, and one of your priorities is quiet, peaceful bays in which one can anchor out for the nightTurkey is it. In general, the winds tend to die down at night, making anchoring in little bays a wonderful option. Turkey, especially the area from Marmaris eastwards, is generally much greener than Greece; much prettier in a lot of ways. The water also tends to be somewhat warmer ( one of the reasons we're in Turkey early and late in the season!). Turkey in general warms up much faster than Greece. So when it's still kinda chilly at night in Greece (April, early May); it's already a very pleasant temperature in Turkey. This factor also leads to a disadvantage for Turkey however; in mid-summer, it gets extremely hotany time from early Jul to end of Aug, we simply don't go, because it's too hot for most people. OK, having done the "big sell" number on Turkeyfor all that it's prettier, the service & facilities are better, the people so friendly and welcomingthere will still always be something magical about the Greek isles. Their ambiance is unique; there's nowhere in the world quite like it. So this has to be the major plus point for Greeceit's "Greek"! The Greeks are a strange combination of "so laid-back they're almost horizontal" and yet conversely, they are full of life and energy, volatile, passionate, ready to laugh and dance the night away at the drop of a hat. Living life for the moment is a way of life in these little islands (what we call the "real" Greece, as opposed to "touristville Greece"the bigger places & Athens are quite different!). If you're a super-keen sailor, and getting some great sailing time in is one of your primary objectionsGreece is the better pick. The winds tend to be stronger, the sailing is more challenging. Traditionally, the windiest times are late July/Augthis is when the meltemi is meant to be at it's peak. These weather patterns have not been terribly reliable these last 5/6 years; but in general, if the sailing side is real important to you, go for Greece. The islands. . .there's just something about sailing from island to island that is unique; it feels like encountering new shores every time. Each of the islands is so different; each has it's own character ( and local "characters"!) ; it's own idiosyncrasies and ambiance. From the upmarket atmosphere of Samos; the bars n' discos n' restaurants; its greenery, the jeeps, waterfall & mountainsto the opposite extreme of tiny fishing villages with nothing more than a taverna, a church (both essential to any Greek community of more than 6 people! ), a scattered collection of little houses and several dozen goats. History. . .though Greece does not have the ancient ruins that Turkey does, the islands still do have plenty of momentos to past civilisations. Fortresses, monasteries, castles dating back to the 10th/11th century are to be found on several of the islands; Patmos in particular is famous for the Cave of St Johnwhere the apostle supposedly wrote the Book of Revelations. Leros has a wonderful 11th century fortress, with the most incredible view of both sunset and sunrise! Turkey might have it's "party spots" in the main towns; but there's nothing like creating your own personal party in a taverna; the smaller the island, the bigger the parties we've had! Whether this happens or not is totally dependent on the group; if it's a quiet group, it'll be a quiet islandbut if everyone's in a mood to dance the night away, there's a few of our local friends who are always happy to help get the party spirit going! This personal connection with the locals is a large part of what makes "our" Greek islands special; we're almost part of the furniture in the Dodecanese by now, and our local friends have a wonderful tendency to "adopt" people who are sailing with us; they'll invite you in for coffee, ouzo, offer to give you a ride to the beach, the locals' bar, whatever's going! Q: OK, I'm soldI wanna go!! How do I get there? First of all, of course, you need to get to Athens! If you already have frequent flyer miles, or a regular travel agentgreat! If you'd like advice/suggestions from us, we are more than happy to help out. Whilst we at SeaScape aren't in the airline ticket business, we do work in conjunction with an excellent travel agent who can get you there, and for a great price too! Contact us for more info. From Athens, you'll need to get a domestic connection on Olympic Airlines to either Leros or Samos. We have extensive notes on all these details which we can email/snailmail to you. The international airport here is Istanbul. 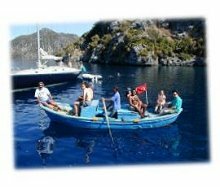 Then, it will depend which trip you are joining where you need to rendezvous with usyou'll need a connection down to either Dalaman or Antalya. Again, we send out detailed notes as needed. Ground transport in Turkey is excellent; there are air-conditioned buses that run regularly between all the major towns, at crazily cheap prices. A: That covers most of the initial questions that people askif you have others, please do give us a call or send email! We're always happy to chat . . .